Art Gelder with his Missouri mulefoot hogs. 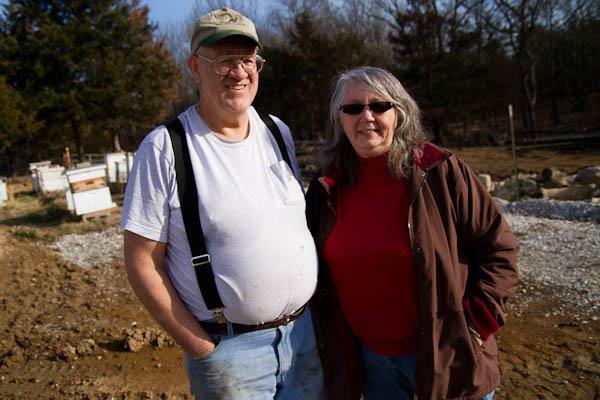 Art and Vera Gelder on their 11 acre farm, just a few miles north of Columbia. Representative Don Ruzicka, Republican from Lawrence County, introduced the agritourism bill. Each summer about 3,000 kids descend on the 11-acre farm run by Vera and Art Gelder, just a few miles north of Columbia. For many kids, it's their first time being amongst pigs and emus. To them, said Art, "Milk comes from the store, bacon comes from the store. They don't see the beginnings of it and they don't realize what all goes into it." So for the Gelders it's about exposing the next generation to the glories of farm life. But it's also about dollars and cents. The Gelders charge $5 per child (this includes homemade honey ice cream), which, they said, helps keep the operation afloat. It's enough, at least, to keep a roof over their heads and to pay salaries to two of their grown children. The one problem with this agritourism operation is the lawyerly question of liabilitly. "People don't always realize that animals kick, animals bite, bees sting," said Vera. "Now, you've come to my farm, who's responsible for that risk? Me or you?" 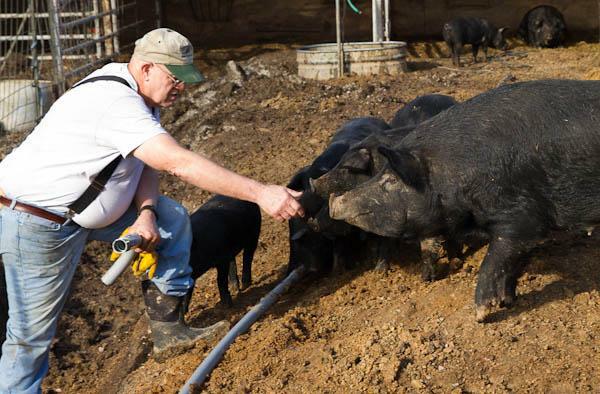 Farmer Larry Helms, who chairs the agritourism committee with the Missouri Farm Bureau, said farmers are very safety-conscious when they invite in the public. "But there are some things that are beyond our control. Tripping on a pumpkin vine if you're out in a pumpkin patch, or if you reach down and lift a heavy pumpkin and you strain your back. There's nothing I can do as a farmer, other than put a sign up, but sometimes things happen." Helms, who lives in Pulaski County, was in Jefferson City yesterday to testify in support of a bill in the Missouri House that would specify that registered agritourism operators are not liable for injury resulting from the "inherent risks of agritourism activities." Risks like tripping over a pumpkin vine. The bill was introduced by Representative Don Ruzicka, Republican of Lawrence County. It's his third try proposing an agritourism bill. The bill passed the House in both 2010 and 2011, but failed in the Senate, in part, due to concerns that it would extend immunity to irresponsible farmers. Sharon Jones, with the Missouri Association of Trial Attorneys, shared those concerns. "If you're doing hay rides, and you haven't checked the brakes on your tractor in ten years, and somebody gets hurt because the brakes go out, well, obviously, you haven't been doing what an ordinary careful person would do. So you should be liable in that circumstance. House bill 1254, as originally written, would provide immunity in that circumstance." 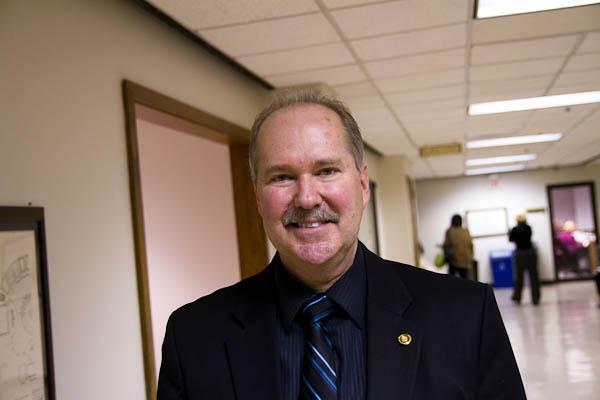 But yesterday, before the hearing in front of the House Agriculture Policy Committee, Representative Ruzicka filed a substitute bill with the committee, after working with the trial attorneys' association to rework some of the language. Jones was happy: "We believe that the committee substitute would allow for some accountability." And so was Ruzicka: "If we can address that issue, make it safer, deal with insurance issues, bring people to the farms, sell more crops, it's one of those scenarios: win-win for everybody."